Nearly a year has passed since first launching our style mixer series and the events we’ve held continue to be incredible gatherings of creatives and art supporters. As mid-August nears P4 is prepping for a new event and we are delighted to announce a partnering of art forces promising to meld the likes of the artistic, stylish and remarkable folks attending the Santa Fe Markets’ festivities. 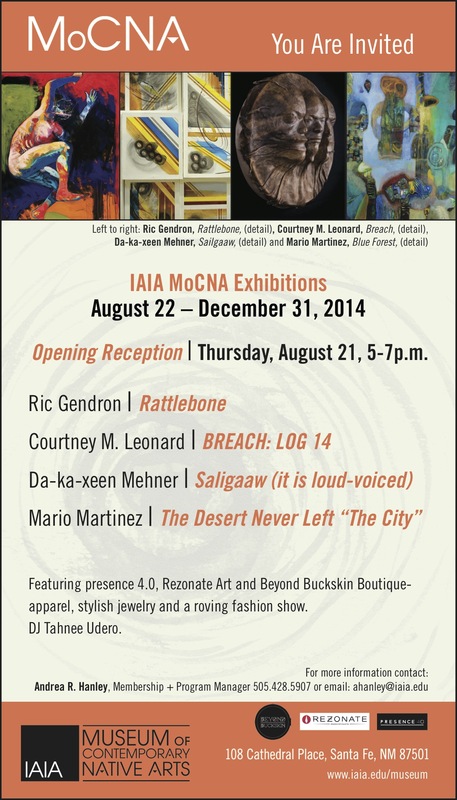 Thursday, August 21, 2014 presence 4.0 will be part of a special evening celebrating the work of stellar artists featured in the opening exhibitions at the Institute of American Indian Art’s (IAIA) Museum of Contemporary Native Arts (MoCNA) in New Mexico. As part of the night’s event, we have partnered with Beyond Buckskin Boutique and Rezonate Art. The two native-owned businesses will bring cutting-edge designs and fashionable apparel as part of a trunk show held during the event. Add to the occasion a roving fashion show, MoCNA’s photo booth, the music of DJ Tahnee Udero, and this will be one event you won’t want to miss! The roving fashion show will feature the work of artists from both Rezonate Art and Beyond Buckskin Boutique’s online store. Models will bedecked in the works of Daryl Gaco-Leon, Warren Montoya, and Jonathan Nelson from Rezonate Art and Jared Yazzie’s OXDX Clothing, The Soft Museum, and Alano Edzerza’s designs from Beyond Buckskin Boutique with more to be added from both stores as the day nears. The resulting show will serve as great inspiration for how to rock these fly designs in your everyday.